OKLAHOMA CITY — Russell Westbrook spoke to the media for the first time since undergoing a third knee surgery in the past eight months. Reporters gathered in front of Westbrook’s locker Sunday and he talked about his rehab and how he’s wanting to come back. It was kind of sad, really. You know, because while the Thunder are often defined by Kevin Durant, they are run by Westbrook. His energy is the identity of OKC. His intensity is the guts of the Thunder. Oklahoma City is elite with him and still a question without him. For now. 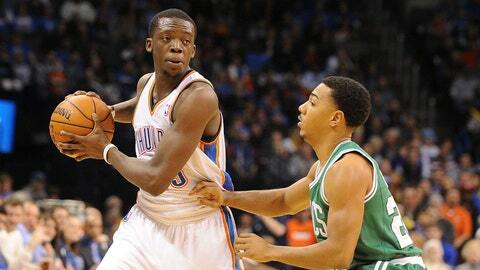 But just give it some time, because Reggie Jackson. Jackson isn’t Westbrook, but he’s on the same page. Sunday showed it as Jackson went for a career-high 27 points on a near-flawless 9-of-12 shooting night, including making all three 3-pointers he took. And once Jackson realizes he doesn’t have to be Westbrook for this Oklahoma City team to be ultra-successful, this team will be just fine. "It’s not easy to come in and be a starting point guard on this team," Durant said. "It’s hard to fill those shoes. You never have a night off at that position. He’s doing a great job." The job is beyond thankless. If Jackson plays poorly, the Thunder suffer and suffer so much it’s visible from the box score to the bleachers. Everyone sees it. It will leak from his own game into Durant’s and it will cause damage in numerous ways, from affecting Jackson’s confidence to everyone saying this team won’t be the same without Westbrook. Poor play can’t be blamed on the fact that Jackson has been thrust into an unfamiliar spot, like last season when he became a starter for the first time in the first round of the playoffs. He’s played enough and played well enough this season (12.4 points per game, 3.7 assists and 3.9 rebounds in 25.2 minutes) experience is a factor that should not be considered. Jackson is more than capable, but only if he gets out of his own way first. Get beyond the fact he’s a starter. Play with the same mentality he had when he was coming off the bench in 25 of his 33 games this year. "I’ve been thinking too much lately," Jackson said. "Especially moving to the first unit, how to play with these guys. I’ve been feeling a little out of character. Just try to get back to myself, try to be aggressive and let everything work out for itself." In the last five games coming into Sunday’s 119-96 victory over Boston, Jackson shot 50 percent or better just twice. He was 4-of-19 in his first start after Westbrook got injured and then went 9-of-26 total in losses to Portland and Brooklyn. "He’s been through a lot," Durant said. "I always want to encourage him, but there are ups and downs in this league. You’re going to have good games and you’re going to have bad games." Jackson busted his way out of that funk Sunday doing what Westbrook does â getting to the rim. "Durant is obvious. Ibaka is obvious," Boston coach Brad Stevens said. "The guys who stand out to me in their improvement, and make them one of the two or three teams favorites to win the whole thing, are that Jackson and Lamb are developing so fast." In the case of Lamb, it’s playing time which has led to production. In the case of Jackson, it’s his ascension to becoming someone who teams have to game plan against. No one gets to the rim more explosively â this side of Westbrook â than Jackson does. Only the pressure Jackson puts on himself will limit him. And that same pressure could limit the Thunder. "Pressure bursts pipes or makes diamonds," Jackson said. "I put a lot of pressure on myself and I expect big things from myself." This team is still Durant’s, but he needs Jackson now more than before. Durant needs a capable scorer to share some of that offensive burden, at least until Westbrook comes back. OKC is 3-2 since Jackson became the full-time starter. There are more than 20 games to go before Westbrook is due back. Now we’re going to see if Jackson is going to turn out some diamonds or burst.